Burstin' with cuteness! Say hello to Bryn E. Sweetberry from the Sweetberry Collection. 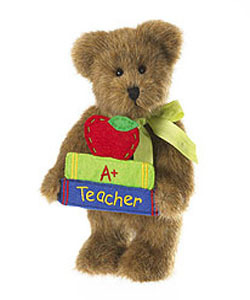 This oh-so-sweet cutie stands 10-inches tall. Crafted in custom blended gold plush fabric, she is fully-jointed with hand stitched nose and mouth and soft felt lined paw pads. Her whimsical romper showcases strawberry and lattice and colorful striped print fabrics, each exclusively designed for the Sweetberry Collection. The romper features eyelet lace trim and capped sleeves, ric-rac details, strawberry red ribbon closures and ribbon gathered eyelet lace bloomers. Her ruffled cap coordinates with her romper with ric-rac accent above the ruffled brim. 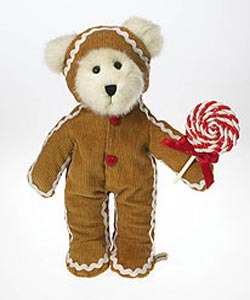 Sharing a sweet message of friendship on her embroidered strawberry costume, Shortcake is an 8-inch gold chenille bear with soft felt lined paw pads, hand stitched nose and mouth and fully-jointed. 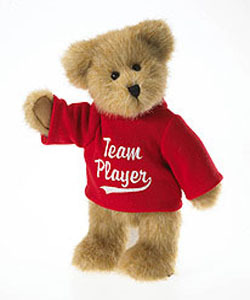 Crafted in red cotton fabric the strawberry costume has an embroidered sentiment reading, "Friends are the Sweetest". Moss green felt accents her leaf inspired collar and stem. Safe in mama's arms! From the 2011 Mother's Day Collection, Flora is dressed in a brightly patterned fabric dress. With exclusive floral and vine patterned fabric designed by The Folks at Boyds, her dress showcases a gingham waist band with a button accented felt star and satin ribbon accents. Flora's elaborate floral embellished ear bow is crafted with layered pink satin ribbons and gingham fabric. Finding comfort in mama's arms...or paws...is Lil' Bell, complete with coordinating ear bow and satin ribbon neck bow. Both mama and baby are fully-jointed and crafted in custom-blended plush fabrics and feature handcrafted details throughout. No three letters touch the heart more than M-O-M! Sharing an embroidered message of love, Forcynthia wears a sleeveless floral and vine print dress designed with fabric exclusively created by The Folks at Boyds. Gingham fabric ribbon accents the bottom of the dress and showcases the embroidered message, "You Are My Inspiration". She holds a ric-rac trimmed fabric heart-shaped pillow accented with embroidered vine design and message. Forcynthia is from the 2011 Mother's Day Collection and is crafted in custom-blended off-white plush fabric, is fully jointed and features handcrafted details throughout. Ella's custom-blended tipped faux mink plush shimmers against her patchwork dress featuring polka-dotted, striped and floral and vine patterned fabrics. Crafted in rust corduroy, Ella's quilted purse features pumpkin stem and vine embroidery and a small fabric patch. 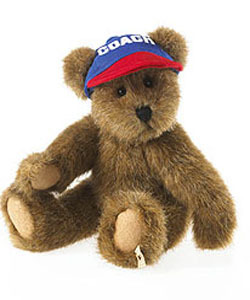 Ella is fully jointed with soft felt paw pads and a hand-stitched nose and mouth. The friendliest scarecrow ever to grace a farmer's field! 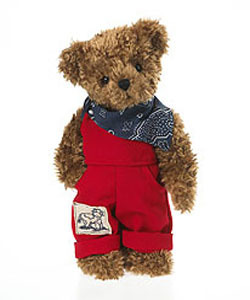 Say howdy to Haywood Patchbeary, Boyds' beary own scarecrow-bear from this season's Patchbeary Collection. Haywood proudly stands at 16-inches tall, is fully jointed with hand stitched nose and mouth and crafted in custom-blended rust plush fabric. 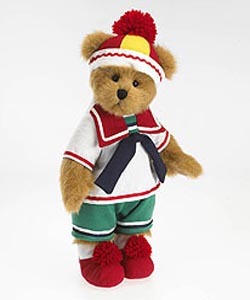 Haywood's scarecrow outfit showcases the three fabrics created exclusively for the Patchbeary Collection. Long chenille strands, appearing to be straw, "peek" from under his floppy, patch accented hat and he holds a pumpkin with quilted details and felt leaf and stem.